The Thunder Bay Yacht Club Racing Program is pleased to announce the introduction of a new program designed to serve racing crews who wish to up their game. The Crew Development Program will be of interest to our racing crew members who wish to advance their understanding of the boat speed, tactical and strategic issues that arise on the race course. Our belief is that an increased understanding of the factors that are the basis of the decisions that are made on the race course will make the sport more fun and enhance the contribution that our crews can make during a race. The course is scheduled to be held on the last three Wednesday evenings in April, just in time to prepare for the upcoming racing season. April 8 / 15 / 22, 6:30-9:30. $55.00. Pre-registration will be required. 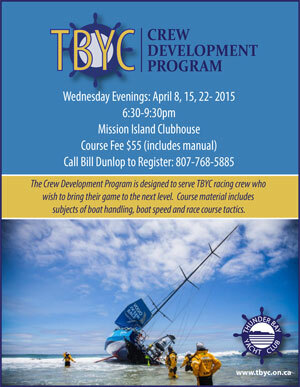 For more information and registration, please contact Bill Dunlop at 768-5885.